"According to Brunswick County Tax Administrator Boyd Williamson, the county enjoyed its largest increase ever in its tax base last year. He says it doesn't surprise him that Brunswick County is performing so well while the national economy is slumping." Home sales across the country have plunged to their lowest level in three years, but builders and the more than 600 realtors in Brunswick County continue to bask in the glow of a red-hot market. "Brunswick County offers such a wide variety of homes for all needs, from first-time home-buyers to couples building their final dream home," explains Debbie Sloane Smith, co-owner of Coldwell Banker Sloane Realty, one of the county's larger realty firms. "The market here is incredible. Since expanding our offices in 2002, we've seen our sales and marketing activity literally double." Last year, this coastal North Carolina paradise spanning from the Grand Strand to the Cape Fear River near Wilmington led North and South Carolina with the largest increase in both the number of single family homes sold over the previous year and total sales dollars. Brunswick County now boasts the fastest growing home sales market in the Coastal Carolinas, with more than double the growth of its closest competitors. Yet the county seems perfectly able to absorb this growth without a hint of traffic congestion or out-of-control commercial development. The county's unique quality of life remains intact despite its tremendous growth. According to figures released by the North Carolina Association of Realtors and the South Carolina Association of Realtors, Brunswick County led both states in 2002 with a sizzling 58 percent increase in existing home unit sales over the previous year and a 66 percent increase in total sales dollars, with a modest 5 percent appreciation in average sales price. If this red-hot pace continues and there are no signs it won't Brunswick County is on pace this year to more than double its last year's record-setting sales performance. Ninety-three percent more single family homes were sold in January 2003 than in January 2002, while February's sales figures were up an incredible 143 percent. According to Brunswick County Tax Administrator Boyd Williamson, the county enjoyed its largest increase ever in its tax base last year. He says it doesn't surprise him that Brunswick County is performing so well while the national economy is slumping. New single family residential construction also is booming in Brunswick County. According to the county Planning Department, more than 1,900 new single family residential building permits were issued in 2002, a whopping $286 million in new construction. Custom builder Vince Tumminello of Tumminello Builders Co., Inc., says the main factors driving Brunswick County's boom market are location, location and location with Myrtle Beach on one side and Wilmington on the other. Craig Lusby, marketing and sales director of Tumminello Builders, says, "After a brutally cold winter up north, two factors that have got to be driving the Brunswick County market are the mild climate and the quality golf and waterway communities we have here." "There is a real pride in Brunswick County in the quality of development," Smith agrees. "Quality, planned growth is utmost in the minds of all of Brunswick County and its developers. Distinctive golf and waterway developments such as The Thistle, Ocean Ridge Plantation, Cape Side, Crow Creek, St. James Plantation, Brunswick Plantation, River's Edge and others provide homeowners a sense of community." Realtors in Brunswick County will tell you as you move eastward through the Brunswick Islands, from Sunset Beach to Ocean Isle Beach to Holden Beach and onto Oak Island, prices shrink and regulations that govern the size and type homes that can be built become less restrictive. While at Sunset Beach the emphasis is on separating residential property from any commercial development whatsoever, new homes and commercial locations such as restaurants are found on Oak Island almost side by side. On Sunset Beach, the westernmost of the Brunswick Islands, Century 21 Sunset Realty Broker Brad Vanderburg says resales are brisk simply because there are so few places left to build. He says Sunset Beach homes are selling in only two to three weeks. The most recent lots sold located in the middle of the island, with no water in sight went for $200,000 to $225,000. "We've got so much going for us in this part of Brunswick County," explains Sunset Beach Mayor Cherri Cheek, who is also the BIC of Ocean Isle Beach Realty, Inc. and has been instrumental in shaping Brunswick County's approach to long-term community development. "It's been a real team effort to keep this part of the county and its beaches pristine, environmentally preserved and free from commercial development." Cherri has been an ardent supporter of the Ingram Planetarium at Sunset Beach a new state-of-the-art facility offering a night-sky spectacular that literally stars Ursa Major, the Big Dipper and Polaris as well as of the Museum of Coastal Carolina at Ocean Isle Beach, which houses an extensive shell collection, a tide machine, a waterfowl diorama, antique fishing equipment, live snakes and other artifacts of the coastal Carolinas. Harvey Mallard, BIC of Cooke Realtors, says his firm stays busy with resales, rentals and new construction on Ocean Isle Beach. He says low interest rates and the large amount of money withdrdawn from the stock market have helped business boom. Donna Wilson has been the top producing agent for Coldwell Banker Sloane Realty at Ocean Isle Beach for the past several years. Her expertise is mostly in resort property. "The growth over these past three years has just been phenomenal," she says. "I tend to think that the largest growth is centered around our pristine shoreline." "Each year I think this is the best year ever and I somehow astonish myself with the next year topping the previous year," Donna explains. "In the year 2000, I sold over $8.5 million. In the year 2001, it was over $9 million. Last year, it was over $13 million, and 2003 looks to be even better." "While most of my clients are from Charlotte, Raleigh, Durham, Winston-Salem and the Piedmont area, I have clients from Maryland, Ohio, Indiana, New York and even Hawaii," she says. "For the most part, they are looking for upscale homes with low maintenance." 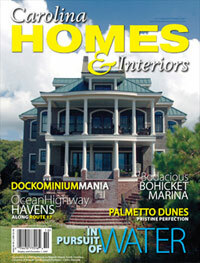 Charles Fox Homes builds many upscale homes at Ocean Isle Beach. "We get a tremendous number of referrals from our past customers," Charles explains. "Both they and their friends really like the homes we've built for them, and they fall in love with Ocean Isle Beach." Charles is also the preferred builder for Coldwell Banker Sloane Realty and its customers. No one is more familiar with Holden Beach than Alan Holden, who owns Remax At The Beach and Sea Castles Construction, as well as Alan Holden Vacations, the largest rental and property management firm on the island. In fact, Holden's ancestors purchased the island from England and gave Holden Beach its name. "Holden Beach is literally being discovered, as the whole county is," says Alan, who was named the top individual REMAX agent in both North and South Carolina for 2002. "In fact, we've just become the highest tax-valued county on the North Carolina coast." "What people like about Holden Beach is that, like Sunset Beach and Ocean Isle Beach, we don't have the neon lights, the noisy night life and other commercial attractions that take away from the beach," he adds. "At the same time, our prices are typically lower than those at Sunset Beach and Ocean Isle Beach." Alan continues: "Holden Beach is also halfway between Wilmington and Myrtle Beach 35 minutes either way so people can have the advantages of city life and golf courses and entertainment options without all the crowds." "While Holden Beach does have some million-dollar homes, most of our homes here are set up as investment rental properties," explains Alan. "Not only is the single family homes market strong here, but so is the vacation rental business." "We see the demand for ocean-front homes here as particularly strong right now," he adds. "They're under contract usually within 30 days of going on the market." Good lots are in such scarce supply in Holden Beach, according to Alan, that he actually has a list of people waiting to buy them. "As soon as a lot is placed on the market, we can make a call and have buyers in here the next morning working out the deal." On Oak Island and at Boiling Springs, 31-year-old Brian Keesee of Brian Keith Keesee Construction can't seem to build homes fast enough. While about a third of his work is for the second home market, Brian specializes in new home buyers and rental home investors. Karen Skipper Anderson of Art Skipper Realty, the sales and marketing agent for the construction firm, says, "Almost as fast as Brian is bringing spec homes out of the ground, buyers are coming along and putting them under contract. I've never seen anything quite like it. In 2001, we built 18 homes. Last year we built 31, and this year we expect to do 60." "Unlike some builders, the first home I ever built I did entirely by myself," Brian says. "I put all the nails in the house and even set all the trusses by hand myself. That hands-on experience has really helped me keep up with this pace of growth. To stay successful, you've got to be grounded in the fundamentals of construction." Based on deed transfers, Brian is one of the top 10 builders in Brunswick County. Oak Island has massive amounts of new construction underway, with new homes and commercial developments being built almost side by side. The one exception is Caswell Beach on the easternmost end of Oak Island, which has a limited commercial district. Once you pass Oak Island at Southport, you reach Bald Head Island, made up almost exclusively of high-end, six-figure and seven-figure homes and accessible only by pedestrian ferry or private boat. To traverse the island, visitors and residents use golf carts and bikes. With pristine beaches, a championship golf course and an elite, upscale lifestyle befitting the richest and most famous, owning a multi-million-dollar home at Bald Head Island is a status symbol that says you have reached the pinnacle of success. A considerable amount of new development and construction is underway at Bald Head Island. As many as 90 building permits were issued in 2002 for residential construction on the island, representing some $37.5 million in construction projects. "In Brunswick County, some of the most interesting property with the most beautiful water views are down gravel roads past dilapidated buildings," says Tom Parks of Coastroad Hearth & Patio, one of the many quality specialty suppliers in the county. "There is incredible potential for redevelopment in areas like these. I expect to see some really exciting things happening here in the middle of the county, as well. We will be seeing a number of new projects focusing on the river, which many people don't realize runs right through Shallotte. There is a very positive movement to keep the things that are quaint and fun about Shallotte intact, while encouraging economic development." How has Brunswick County's roaring home sales market impacted local retail businesses, suppliers and subcontractors? Very nicely, according to local community leaders. In the past five years, Lowes Home Improvement Center has opened a superstore in Shallotte and built a new store in Southport. Home Depot has opened a store in Shallotte. Meanwhile, local suppliers of building materials, appliances, furnishings and specialty products all seem to be holding their own. "That would tell me the building boom is having a big effect on retail businesses," Williamson, the Brunswick County tax administrator, explains. What is interesting about Brunswick County is the wide diversity and extremely high quality of specialty suppliers and subcontractors in the area. They work hand-in-hand with local builders to add distinctive finishing touches to the homes being built in Brunswick County. Among them are Shutters By The Sea, Coastroad Hearth & Patio and Right Angle Ceramic Tile, whose work and products are known and used in finer homes throughout the area. Will growth eventually erode the quality of life in Brunswick County, as it has elsewhere in the Coastal Carolinas? Williamson best sums it up this way: "Brunswick County is still a great place to live, and the quality of life is still good. New people bring diversity and diversity creates culture. Just as we can't turn away the newcomers, they can't expect to change the old-timers. I think the key is we can't destroy what brought us here or what kept us here." "Coastal counties like Brunswick are fragile," he adds. "As long as we understand it, respect it and take steps to protect it, we can maintain the quality lifestyle."